Tim Neal made national headlines in 2001 when a referee suffered a major heart attack and collapsed in front of tens of thousands of spectators during the fourth quarter of an East Carolina University versus Syracuse University football game. Neal, who served as head athletic trainer for Syracuse at the time, was among a team of medical professionals who rushed to Gerry Bram’s side to use an Automated External Defibrillator (AED) to jump-start his heart. Bram was immediately transported to a nearby hospital, and after receiving emergency heart catheterization he survived. He and Neal remain friends today. Once considered a luxury for college athletic trainers, the AED is now a staple on sports sidelines. It was Neal who advocated that the university purchase one. 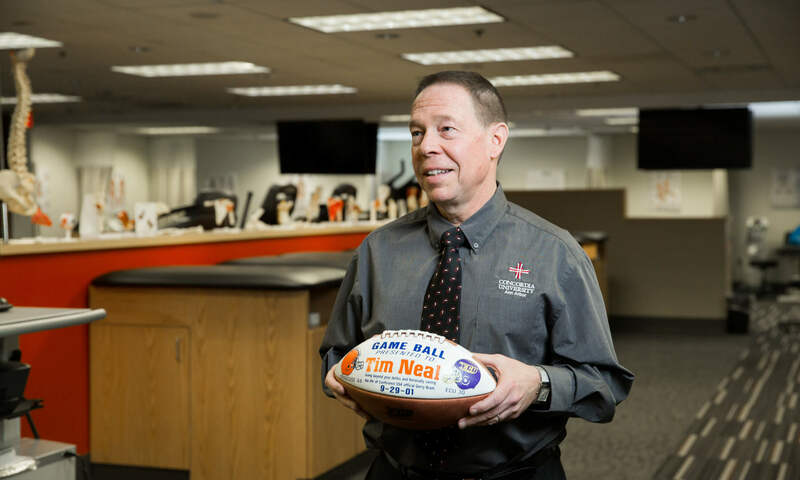 In fact, the first AED in Syracuse (and national collegiate-level) history arrived just six weeks before Bram’s near-fatal incident, and with one life-saving jolt Neal helped build the case for AEDs to be added to the toolkit of sports medicine teams nationwide. The miraculous story is one of many anecdotes Neal, who now serves as director of Concordia University Ann Arbor’s athletic training program, likes to tell his students. Stories of his in-the-field experiences bring the class content to life, he says. And Neal has plenty of stories to tell. Over the course of his renowned career, he’s saved dozens of lives, mended too many broken bones to count, and helped shape the athletic training field in extraordinary ways. Neal, along with others he has collaborated with, has mentored dozens of young athletic trainers who have gone onto athletic training careers in the NFL, NBA, NHL, WNBA, universities and high schools, both in clinical and academic roles. Now, in the latter part of his career, Neal has moved from the big stage of Division I athletics to the intimacy of the close-knit Concordia community, so that he can help train the next generation of compassionate caretakers. Neal, a strong Christian, says Concordia’s mission of preparing students in “mind, body, and spirit for service in the Church and world” aligns with his Christian values and life’s work. At Concordia, he eagerly shares his faith in the classroom while pushing students to excellence in their future vocations. Feedback from CUAA students pays tribute to his teaching approach. Responses from students surveyed in 2016–17 placed Neal among the top 10 full-time professors on the Mequon and Ann Arbor campuses—both for his overall teaching and his ability to incorporate faith in the classroom. Rigorous attention to detail, commitment to continuous improvement, and bringing one’s “A game” each day are hallmarks of his approach. Neal is also nationally recognized for his expertise, which focuses on athlete mental health considerations, emergency preparedness, and concussion assessment. As the National Athletic Trainers’ Association (NATA) liaison to the NCAA Football Rules Committee in 2008, Neal wrote language for the NCAA targeting rule—the one that more than a decade after it was penned into existence is still a regular topic of discussion among sports fans and commentators. His faith underpins his professional accomplishments and serves as the motivation for his unique approach to the athletic training field. From torn ligaments to psychological trauma, compassionate care is necessary for the array of situations in which athletic trainers might find themselves. With an estimated one in four people nationally who meet the criteria for a mental health disorder, athletes certainly aren’t immune to the concern either. Neal demonstrates his commitment to the psychological well-being of athletes and athletic trainers alike in a number of ways. During his time at Syracuse, he developed a protocol for athletic staff and coaches that ensured that athletes would receive the mental health care they needed, and has helped numerous other colleges adopt similar policies. He also regularly travels to state universities across the nation to train personnel on a short-term psychological helping process called Critical Incident Stress Management (CISM). Through CISM, an individual learns a series of skills to help normalize the events of a traumatic incident so that victims can return to their lives or be encouraged to seek professional mental health care, and, ultimately, avoid the effects of post-traumatic stress disorder. In 2016, spurred by Bram’s heart attack and witnessing the angst that fellow athletic trainers experience after handling critical incidents like Bram’s, Neal teamed up with other professionals to develop a NATA peer-to-peer support program called ATs Care, which applies CISM to help athletic trainers cope after a critical incident. Neal is an approved instructor of CISM, one of only a handful of athletic trainers nationwide certified to instruct fellow athletic trainers in this technique. The value that Neal places on caring for individuals holistically is one that’s supported by CUAA, as well. It’s part of what makes him feel at home at Concordia. 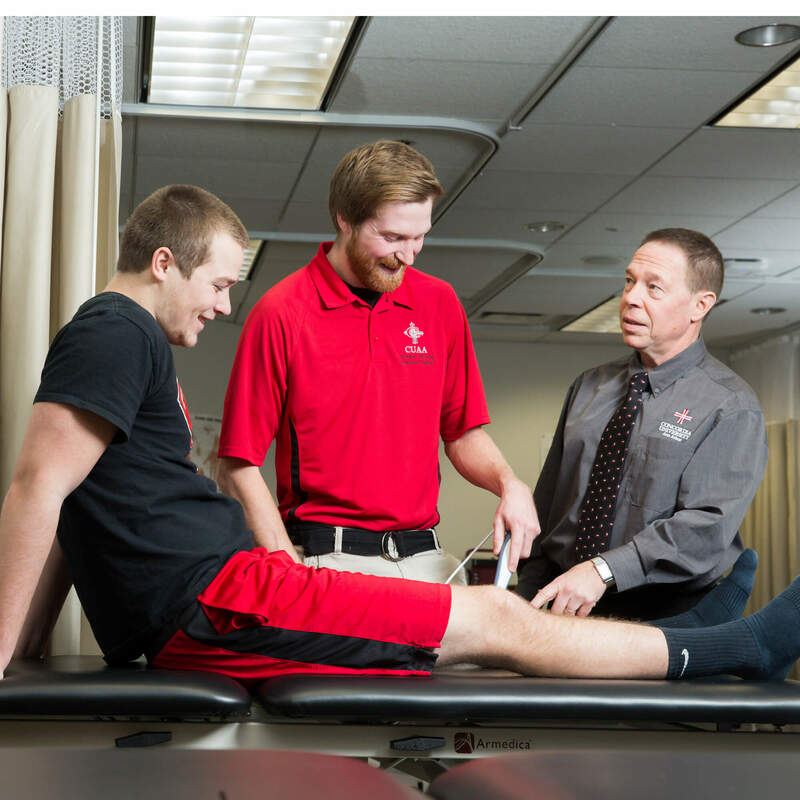 If you’re interested in becoming one of Neal’s students, learn more about CUAA’s athletic training program at cuaa.edu/athletictraining. Wrote the language for the rules that news reporters and sports commentators refer to as “targeting.” Written with the intent to assist referees in preventing concussion-related injuries, the NCAA Football Defenseless Opponent and NCAA Football Helmet Contact penalties are arguably among the most significant policies in college sports history. Served on NCAA panels concerning concussion management, student-athlete mental health and wellness, and student-athlete sleep and wellness. Served as athletic trainer on the United States Olympic Committee from 1985–87. Was given the NATA Most Distinguished Athletic Trainer Award in 2010. Received the NATA “Tough Cases” Award for Outstanding Performance in the Athletic Training Profession in 2002 for the part he played in saving Bram’s life. Is presently the chair of the NATA Committee on Professional Ethics, and is a member of the ATs Care and Professional Responsibility in Athletic Training committees. Watch Tim Neal spring into action to save Gerry Bram’s life! View the video at YouTube.com/cuannarbor.